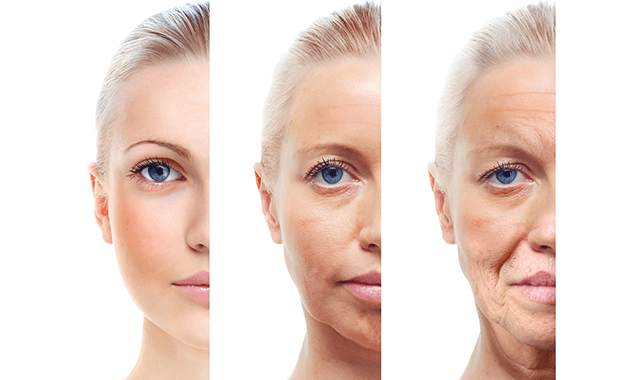 Sunscreen: The first rule to prevent and correct aging is to wear a broad spectrum sunscreen. This means that the product protects against both UVA (aging) and UVB (burning) rays. These rays release free radicals, which break down the healthy skin cells, causing loss of collagen and elastin, hyperpigmentation, and overall aging. A good sunscreen contains the ingredient zinc oxide, or sometimes even titanium dioxide. We carry a few of these broad spectrum sunscreens at Virginia Surgical Arts, including our VSA Skincare Triple Action Sunscreen. Now we’ll move onto the Vitamins. They further protect your skin cells from UV damage, pollution, and free radicals. The most common and most important are Vitamins A, C, and E.
Active Vitamin A (aka Retinol/Tretinoin/Retin A): This ingredient’s main function is skin cell turnover, which produces collagen—the stuff your skin had a lot of in its “prime.” The key to younger-looking skin lies in keeping skin cells active. Once you hit your mid 20’s, your skin cells decrease in its cellular turnover, resulting in fine lines, dull skin, laxity, and wrinkles. Vitamin A is like a gas pedal for the skin—it tells the skin how fast it needs to go for healthy cellular function. Continued use of it in higher, medical grade concentrations wake the cells up and puts them back to work. Our VSA Skincare Smooth Skin Pads are the most popular of our products, and will deliver a potent Vitamin A that’s buffered with plenty of antioxidants, reducing any irritation Vitamin A is known to cause. Be advised– Retinol and Tretinoin are pure and active derivatives of Vitamin A. If you use a low concentration of Vitamin A, or take oral supplements of vitamins, you will not achieve the same results. The skin is the last of the body to receive the “good stuff” of anything you ingest, so it’s imperative to nourish it topically. Active Vitamin C: This is another antioxidant, but it works differently. Vitamin C helps make collagen. It also helps to correct hyperpigmentation and retain or regular moisture. These properties are very valuable features to your skin because it will stabilize free radicals, and in doing so, protects healthy cells from getting damaged. To simplify, it’s an excellent preventative measure against wrinkles, as well as the photoaging caused by sun exposure. We offer a few stabilized, active Vitamin C products, including our popular VSA Skincare Bright Skin Pads. Vitamin E: Your skin has its own “ozone” of sorts, which helps protect it against external factors. This layer is comprised of lipids, and Vitamin E keeps these lipids healthy and functioning. It helps protect the skin from UV rays and, as an added bonus, softens and smoothes, too! Many of our moisturizers at the office contain Vitamin E, but one of our favorites is VSA Skincare Daily Essential Moisturizer. When looking for your sunscreen and ACE products, quality is key. It’s so important that active ingredients, like Vitamins A and C, are properly stabilized, packaged, and stored. They can’t be exposed to light or UV rays, as the formula might become inactive. That’s why it’s imperative to buy these products from a licensed and certified medical provider- you know the quality will give you the results you desire. Do yourself a favor—Do your research, shop smart, and you’ll ACE anti-aging! To schedule a complimentary skin analysis with us, please call our office at (757) 430-7690 or Contact Us online!